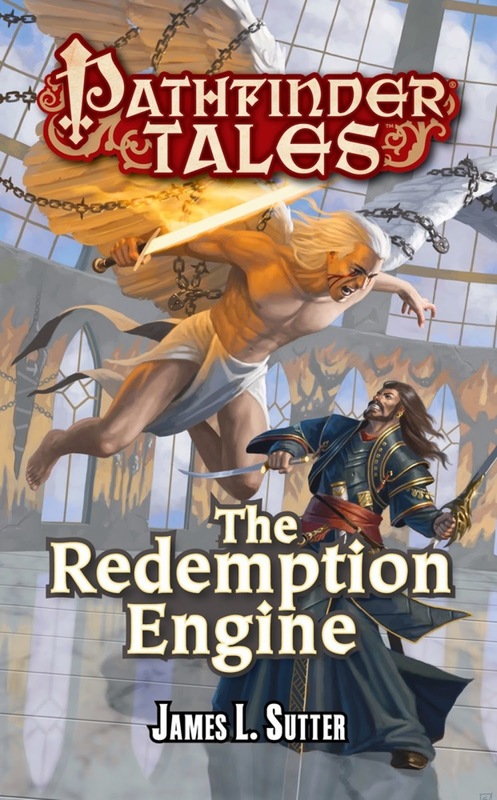 The Redemption Engine by James L. Sutter is a novel set in the Pathfinder universe. I am completely new to Pathfinder, so I can say with assurance that this book requires no prior knowledge to enjoy. A basic understanding of conventions like the axes of chaos vs. law and different dimensions might lower the learning curve, but Sutter does an excellent job of playing both sides: this story is simultaneously one that a newcomer can enter into with no trouble and one that delves so deeply into the Pathfinder universe that longtime Pathfinder players and readers won't be bored, either. Pathfinder is a classic high fantasy universe, and yet at the same time it's anything but. Longtime fantasy readers will recognize familiar tropes, but Sutter doesn't let any assumption stand untested or uncomplicated. In many ways The Redemption Engine reads almost like urban fantasy, because the city of Kaer Maga is absolutely essential and integral to everything that occurs and is almost a character in and of itself. Not only that, our protagonist Salim is sort of fulfilling the role of a private investigator with magic — except that he's actually been tasked by a goddess he despises. I have rarely read a book with each setting so completely fleshed out: thoroughly gorgeous descriptions and thoroughly problematized conflicts. This story examines its characters' and worlds' assumptions at every turn. If you are feeling starved for high fantasy with diverse characters, definitely check this out, too. Kaer Maga is many things, but homogenous and predictable are not among them. My absolutely favorite aspect of this book is that free will is at the center of the story. What free will is in a world with gods, what that means to different people, why it's never simple, and how free will is at the core of all the choices and conflict in this story. Salim has a pretty solid understanding of himself and his choices at the start of this story, but by the end his understanding has deepened and changed. I've seen enough empowered protagonists stagnate that I really appreciate one who starts competent and yet still gets a strong character growth arc. If you love exploring detailed settings with diverse characters, philosophical quandaries, and sorcerous battles, check out The Redemption Engine.